The display of Capt. and Mrs. Williams at the museum entrance has been updates with photos from the early early years of the museum. The Ocracoke Preservation Society celebrated its 35th anniversary with an Open House on Thursday, April 12, 2018. 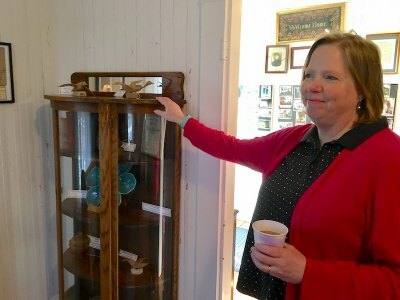 As residents and visitors wandered throughout the museum enjoying the refreshments and new exhibits, founding member Linda Scarborough reminisced about the museum’s start which began when local residents David Esham, Philip Howard, and David Senseney expressed a desire to preserve the history of the island. Ocracoke had begun to change, from the establishment of a Navy base during WWII, paved roads spanning the length of the island in the 1950’s, and with regular ferry service in the 1960’s bringing larger numbers of visitors. Many local residents were concerned that these changes were erasing much of the island’s rich history. According A History of Ocracoke Preservation Society posted on the Village Craftsman website in April 2011, many of the historic buildings in the village were being destroyed to build modern motels, businesses, and homes. In addition there was no central storage area to preserve documents and to keep artifacts of historical value. A new display highlights Lt. Maynard, the British Royal Navy officer credited with killing the pirate Blackbeard. Early in 1983, Anita Fletcher, Linda Scarborough, David and Sherrill Senseney, and Philip and Julia Howard met in the Senseney’s living room to discuss the formation of an organization dedicated to the preservation of the history of Ocracoke. Their mission would be multi-faceted by preserving and sharing the history of the island, preserving the historical feel of island structures, and serving as a land trust. This was followed by an organizational meeting in March. The meeting was well attended, possibly due to the enticement of free clam chowder prepared by local fisherman and cook Clinton Gaskill. The results of that meeting were an approval of the by-laws and a full slate of officers headed by President David Esham. Linda remembers an early meeting at the home of Larry Williams’s mother Ms. Lola (the current location of the Ocracoke Youth Center Thrift Shop). David Senseney had just come from a performance of “A Tale of Blackbeard” and was still in costume! She recalled some of the events held in the early years such as the History Days at Berkeley Castle (now the Castle B&B). Stretching for three days over the July 4th holidays, the Castle was transformed into a temporary museum showcasing a multitude of village artifacts and visited by large numbers of residents and visitors. This event was repeated the following year. Administrative Assistant Mary Bryant shows a new piece to the museum, a china cabinet from the collection of Kenny Ballance. In the late 1980s a developer purchased the Captain David and Alice Williams home located on the harbor in order to build the Anchorage Inn. The house, slated for demolition, was donated to the Ocracoke Preservation Society, a long term lease was negotiated with the National Park Service, and the building was moved to the current location adjacent to the NPS parking lot. The museum finally had a permanent home! Linda recalls the first OPS Wassail Party held in the new location in the early 90’s. It was very, very cold and someone suggested supplementing the wassail with rum. That didn’t happen and somehow the Wassail Party continued and endures as a regular December event, still sans rum. The museum continues to grow and carry out their mission. 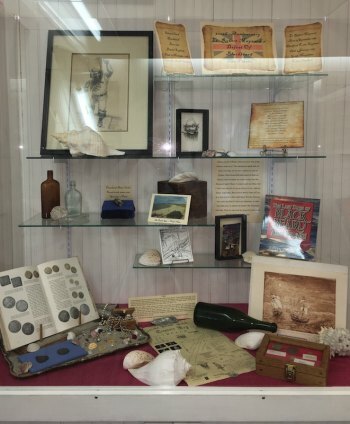 During the open house, Administrative Assistant Mary Bryant pointed out some of the new exhibits such as a china cabinet acquired from Kenny Ballance, a group of vintage photos on loan from Woody Billings, and a new display featuring Lt. Robert Maynard, the British Royal Navy officer credited with killing the pirate Blackbeard off the coast of Ocracoke in 1718. Though the Open House attendance was light (perhaps because it coincided with the first warm and lovely day in weeks) the attendees were enthusiastic. First time visitors to Ocracoke Joe and Julie Criste were impressed with the exhibits and said that Ocracoke reminded them of Mackinac Island, a popular vacation destination in their home state of Michigan. However, they pointed out, that Mackinac Island doesn’t permit car traffic and Ocracoke is larger, but they like the relaxed and laid back small town atmosphere. The Cristes, who were on vacation for the week and staying in their motor home in Rodanthe, had been to North Carolina only once before to visit the Smoky Mountains. They made a point to see the Outer Banks on this visit. Julie say were having a great trip and were thankful for the change in weather from cool and damp to sunny and warm. Duncan McClain points out his favorite cookies. Local first grader Duncan McClain came to the open house directly from baseball practice. He was excited both about his first game coming up and the cookie offerings, his favorite being the sugar wafers and the chocolate and vanilla sandwich cookies. However, he was also spotted eating the lemon Oreos. Museum volunteer Tory Kane was enjoying the sunshine, fresh air, and rocking chairs on the front porch. She relocated to Ocracoke from New Jersey a year ago and immediately became involved with OPS. “I love looking at the old photos and artifacts and learning the history of Ocracoke,” she said. Tory also enjoys helping out with special events at the museum and was part of the Special Events committee that assisted the museum staff with planning the Open House. Other members of the committee are Laura McClain, Ann Borland, Amy Howard, Sundae Horn, and Debbie Leonard. 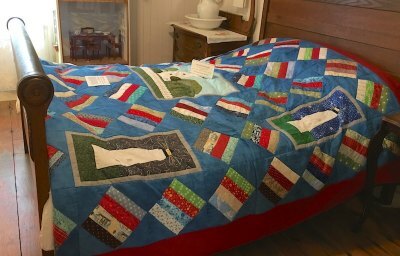 Raffle tickets are available for this handmade quilt by the Ocracoke Needle and Thread Club. The winning ticket will be drawn at the Wassail Party in December. 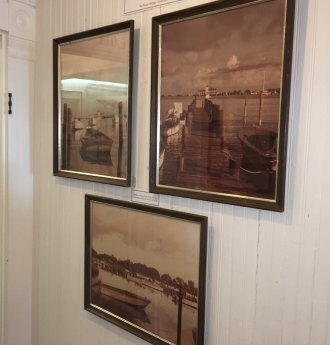 Also new this year is a collection of vintage harbor photos on loan from Woody Billings.